U.S. Ambassador Nikki Haley condemned Russia’s “aggressive actions” in eastern Ukraine on Thursday and warned Moscow that U.S. sanctions imposed after its annexation of Crimea will remain until the peninsula is returned to Ukraine. 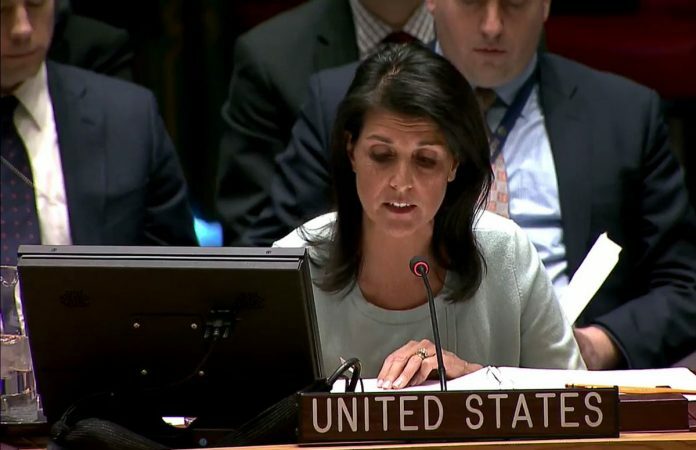 But the new American envoy tempered her criticism, saying it was “unfortunate” that she had to condemn Russia in her first appearance at the U.N. Security Council. “We do want to better our relations with Russia,” Haley said, echoing President Donald Trump who has also said he wants a better relationship with President Vladimir Putin. Churkin said the Trump administration is just in its early days and both countries are dealing with very difficult problems. One of those complex and urgent issues is Ukraine, where there are definitely major differences. Anti-government protests in Ukraine culminated in President Viktor Yanukovych fleeing the country in February 2014 to Russia. Later that year, Russia seized and annexed the Crimean Peninsula from Ukraine, and Russian-speaking separatists in the country’s east launched protests that escalated into a war that has killed more than 9,600 people. The Minsk agreement in February 2015 aimed at ending the conflict helped to reduce fighting, but skirmishes have continued and there was a major escalation of violence in recent days. Churkin blamed Ukrainian security forces for starting it and Ukraine’s U.N. Ambassador Volodymyr Yelchenko blamed the Russian army and the separatists. Haley made clear the Trump administration’s strong support for Ukraine, despite the president’s overtures to Russia. “The dire situation in eastern Ukraine is one that demands clear and strong condemnation of Russian actions,” she said. Haley called for an immediate end to fighting and “full and immediate implementation” of the Minsk agreement. Russia’s annexation of Crimea, however, remains a major obstacle. Haley said “the United States continues to condemn and call for an immediate end” to Russia’s occupation. Churkin, exercising his right of reply, pointed out that the U.S. Constitution starts with the words “we the people,” and in Crimea the people voted overwhelmingly to return to Russia. He also used the reply to welcome Haley, saying “from time to time we may have differences emerging on various issues, but your work will hold the key to whether the Security Council” can operate collectively and carry out its primary responsibility for maintaining international peace and security.